Wil Myers (SD - OF) Myers recorded two hits in the Padres' 6-3 win over the Diamondbacks Thursday. The Padres' slugger also recorded two RBI and scored once in the victory. In 92 plate appearances this season, Myers is slashing .279/.326/.442 with two home runs, 11 RBI, 11 runs and two stolen bases. The 27-year-old has been solid since coming off the DL and continues to be a source of homers and steals, even though 20 stolen bases may be a tough number to reach in 2018. It would be a welcomed site to see Myers walk more to make him more OBP friendly, but double-digit steals from your 1B is tough to come by. His moving to the outfield full time drops his value a bit once he loses first base eligibility. Harrison Bader (OF - STL) Bader smacked his sixth homer in the Cardinals' 11-2 beatdown of the Giants Thursday. The rookie ended the day going 3 for 5 with two RBI and two runs in addition to the homer. On the season, Bader is slashing .274/.339/.423 with the six homers, 14 RBI, 29 runs and eight steals. No matter the level, strikeouts have been a part of his game, but with his .365 BABIP and 7.3% BB% his OBP remains solid. Bader will be an excellent source of speed and power, but his slash line figures to drop a bit. Brad Hand (RP - SD) The Padres' closer locked up the 6-3 win over the Diamondbacks by striking out the side Thursday. The save was his 24th in 28 tries as he continues to be one of the top closers in the game. Hand is stranding 70.5% of runners and owns a 3.05 ERA. His 61/15 K/BB ratio translates into a 13.28 K/9 as he is helping ratios in addition to recording saves. Hand also remains a popular name as the trade deadline approaches. If he is dealt Kirby Yates could be a hot waiver wire add as he figures to be next in line for save chances in San Diego. Brian Anderson (OF - MIA) Anderson was able to get in on the offensive explosion as the Marlins fell to the Nationals 14-12 Thursday. The Marlins' outfielder was 2 for 4 at the dish and plated three runs with a longball. On the season, the 25-year-old is slashing .284/.361/.412 with six home runs, 44 RBI, and 50 runs. Anderson has shown he can flat out hit, but the big question mark is will he develop more power? So far in his career, he has hit for double digit bombs just once in the minors, but the power tool could still develop into 15-20 homer pop in the majors. He's striking out under 20%, as well as walking 8.9%, and sporting a .342 BABIP, which helps his OBP stay legit. Anderson doesn't figure to be a huge power source but makes for a late option at third base that can contribute in most other categories. 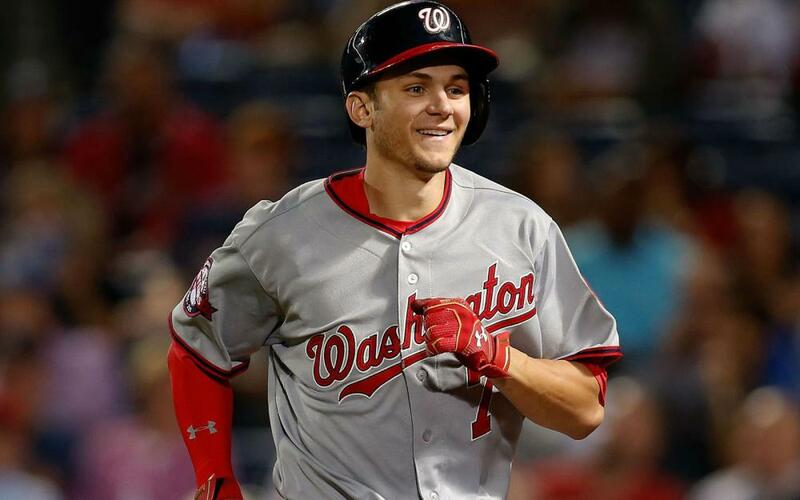 Trea Turner (SS - WAS) Turner was an absolute monster Thursday in the Nationals 14-12 win over the Marlins. The Nats shortstop was 3 for 5 with an eye popping eight RBI and three runs scored. Five of the RBI came via the home run, including a grand slam off Marlins reliever Adam Conley. After a bit of a slow start in terms of his first round ADP, Turner is rounding into form. Thursday's explosion raised his slash line to .280/.357/.427, along with 11 home runs, 37 RBI, 51 runs and 22 steals. The home run total matches his 2017 total, and he is just 13 games away from matching his games played from 2017 as well. Turner has raised his BB% to 10.2%, which is up nearly 4% from last season as well. Turner is well on his way to returning first round value, if he can stay healthy.